Is your little one fascinated by mice? Some people might think it's kind of weird because they are considered a pest by most people. But when we take away our prejudices, mice are uber cute! They've got those little pink paws, a silky tail (unlike the bare scaley tails of rats) and wide eyes that are always on the lookout for danger. And then there's the imagination potential. We've been adults for a while now and we're still convinced that mice have adorable secret lives inside the walls of old homes. You know what we're talking about it, right? They set up their living rooms with little thread spools, a matchbox bed, and use stamps for fine art around their little abode. With images like this dancing through our heads, we understand why your little one would want to be a house mouse for their next dress up party! You won't be able to stop yourself from taking photos of this sweet mouse, getting this rodent to say cheese will be no problem. This silky gray jumpsuit will make your little one feel cozy like that mouse in its makeshift home as soon as they put it on! The hood with its large pink trimmed ears secures under your child's chin with a touch strip. And most importantly, the cheese lays over your child's shoulders in removable straps so your kiddo can take it off when they get in the car and put it back on when it's time for pictures. Are you ready for a fully adorable Halloween? This outfit is one for the books, no matter how you feel about seeing a mouse in your house. Want your children to wear matching costumes? 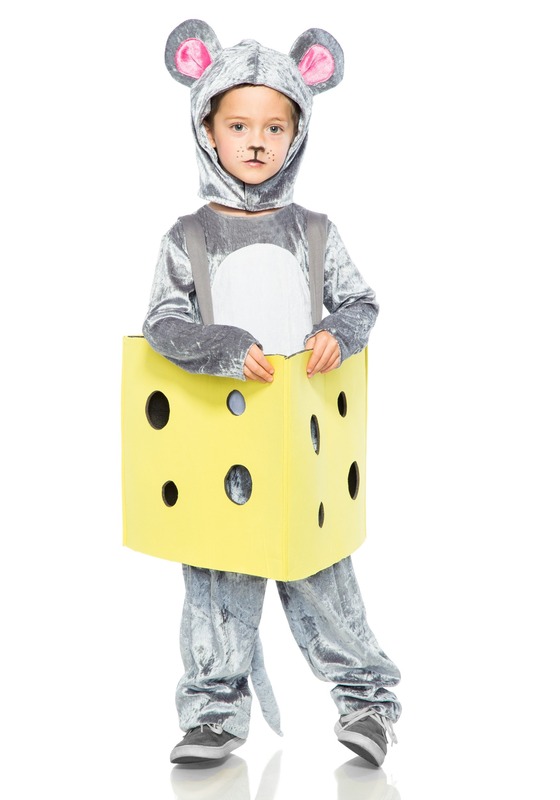 Consider having your mouse's brother or sister dress up as a cat. If they're going to argue over their candy at the end of the night, might as well have their costumes be on-theme!